The Council of British Druid Orders is a neo-pagan group that holds ceremonies at Stonehenge. Tim Sebastian [Founder of CoBDO] used the title, "Archdruid of Wiltshire, Chosen Chief of the Secular Order of Druids, Conservation Officer for the Council of British Druid Orders and Bard of the Gorsedd of Caer Abiri (Avebury)." The group is best known for presiding at mid-summer festivals held since 1999. Up to 24,000 have attended. These festivals are a successor to the Stonehenge Free Festival that was held from 1974 to 1984. In addition to the above list of members there have been numerous other members of C.O.B.D.O over the years who are not historically listed. ^ Wallis, Robert (2003). Shamans/Neo-Shamans: Contested Ecstasies, Alternative Archaeologies, and Contemporary Pagans. Routledge – via Questia (subscription required). p. 145. ^ Vidal, John (22 June 2000). "The weird and wonderful return to get stoned at Stonehenge". Guardian. Retrieved 4 October 2014. 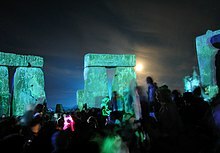 ^ "Time Zones: Five Hours of Solstice Reverence and Revelry at Stonehenge," Washington Post, June 24, 2009. ^ "As dawn broke on the longest day of the year, 24,000 witches, pagans and druids descend on Stonehenge," Daily Mail, 22 June 2007. This page was last edited on 26 August 2017, at 03:57 (UTC).